Republicans rolled out their new "woman" strategy during the State of the Union: pit married mothers against other women. 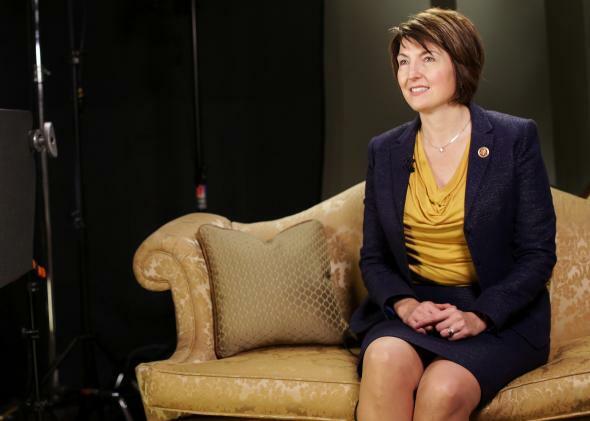 Rep. Cathy McMorris Rodgers rolled out the new GOP narrative last night: “Strong” women don’t need reproductive rights. While most of the post–State of the Union attention will be paid to the president’s remarks, Tuesday night was a big night for Republicans as well. The GOP stealthily unveiled what appears to be their plan going forward when it comes to trying to appeal to women and shutting down the toxic narrative that they’re waging a war on same. No, it doesn’t involve ending the war—that would require giving up the support of the angry white men and the Christian-right activists that make up their base voters—but it does mean realigning their priorities, especially when it comes to the image they try to project in public. After Tuesday, it became clear that the Republican strategy is now to send positive messages of support for working women while doubling down on the attacks on reproductive rights. Step two: After demonstrating some enthusiasm for the working gals on camera, double down on the attacks on reproductive rights. This was left to Rep. Cathy McMorris Rodgers, who gave the official GOP response speech. Most of the speech was vague platitudes, but a large chunk of it was driving home the message that she had three kids, one with Down syndrome, in six years while also being a congresswoman. “Cole, and his sisters, Grace and Brynn, have only made me more determined to see the potential in every human life—that whether we are born with an extra 21st chromosome or without a dollar to our name—we are not defined by our limits, but by our potential,” she said. The insinuation was quite clear: Anyone who thinks they need those birth control pills and legal abortions in order to avoid poverty and advance in their careers is a weakling who can’t cut it and certainly doesn’t deserve the easy access that Democrats advocate for. It’s easy to see what’s going on with this rhetoric. It’s an attempt to pit married mothers against all other women, by flattering married mothers with images of how hard working and sexually restrained they are while suggesting that all those other women—the single mother and the childless woman who doesn’t have to leave work early to get her kids out of day care—are either lazy, spoiled, or immoral. As Hanna Rosin wrote here at Slate on Tuesday, Rodgers is the new ideal for Republicans: “Pen in one hand, baby in the other, having it all, all by herself.” The hope is that they can take the sting out of the phrase the “war on women” by highlighting women who don’t “need” those icky reproductive rights to get ahead. It’s an intriguing strategy, though one that likely underestimates how many married mothers also see themselves as people who need contraception and even abortion access. But will the narrative survive the ultimate test, when Hillary Clinton runs for president and reminds the public that there are plenty of married mothers who support the rights of all women, regardless of their marital or reproductive activity?